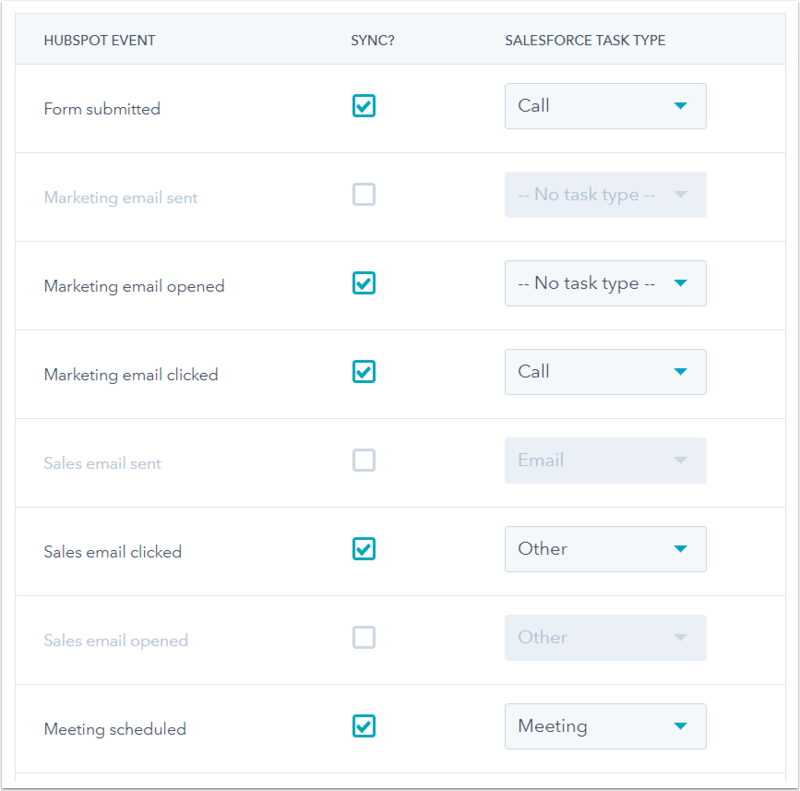 With the HubSpot-Salesforce integration installed, you can sync HubSpot marketing and sales activities (e.g., emails, notes, meetings) with Salesforce tasks for a more complete picture of interactions with your leads and contacts and your team's productivity. You can also report on HubSpot activities in Salesforce. Click to toggle the Salesforce task sync switch on. To set up bidirectional sync for HubSpot and Salesforce tasks across both systems, enable timeline sync for HubSpot tasks. Please note: when you enable the Salesforce task sync, new Salesforce tasks will sync to HubSpot going forward. Learn how to import existing Salesforce tasks into HubSpot. You can sync HubSpot marketing or sales activities to Salesforce as tasks. For example, a contact opening a marketing email can sync to Salesforce as a task. If you're using HubSpot integrations and/or HubSpot's ads tool, you can also sync associated contact activities to Salesforce as tasks. Select the checkbox next to a HubSpot marketing or sales activity to sync to Salesforce as a task. To sync contact activities associated with HubSpot integrations and/or HubSpot's ads tool, select the checkbox next to Installed integration event. Please note: only data from HubSpot integrations that create timeline events will sync to Salesforce. Connected integrations that create timeline events are visible on contact records, in the Filter activity dropdown menu, Integrations section. To specify the Salesforce task type for the activity, click the Salesforce task type dropdown menu and select a task type. If you don't select a specific task type (i.e., -- No task type -- is selected), the activity will sync to Salesforce as a task without a type. To set up bidirectional sync for HubSpot and Salesforce tasks across both systems, enable the Salesforce task sync. Please note: when you enable timeline sync for HubSpot activities, new activities will sync to Salesforce going forward. Existing HubSpot activities will not sync retroactively. 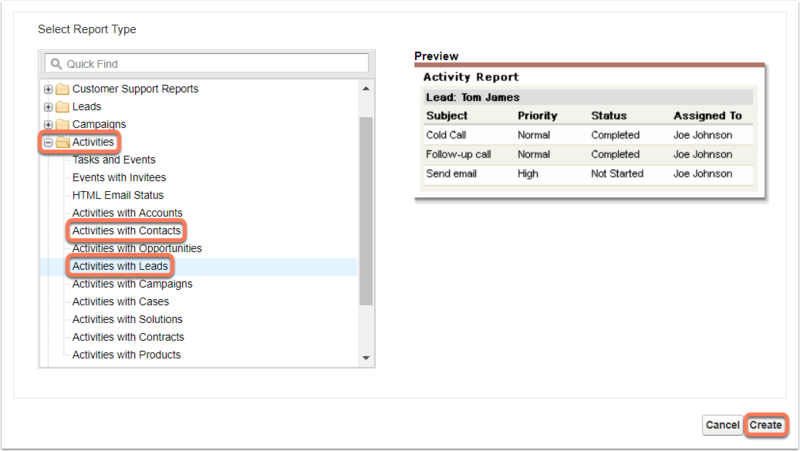 After syncing HubSpot activities to Salesforce tasks, you can report on them in Salesforce by creating a custom activity report. Navigate to your Salesforce account. Click the + icon to expand the Activities folder. 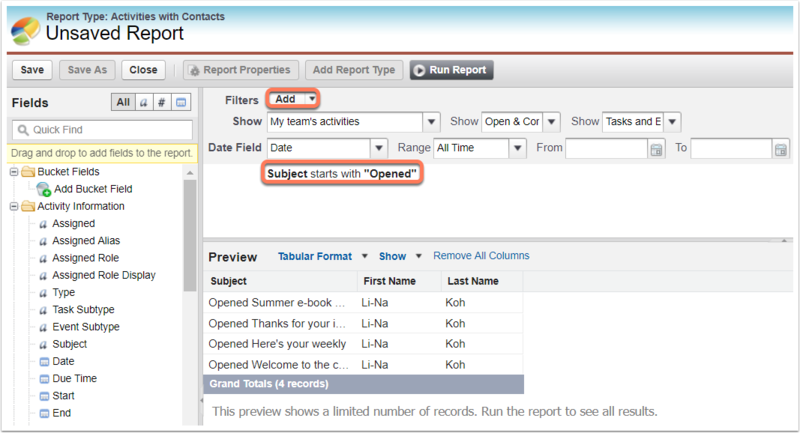 Click Activities with Contacts or Activities with Leads (separate reports must be created for contacts and leads). In the bottom right, click Create. Next to Show, select which activities, activity statuses, and activity types to display. To filter by a specific activity type or activity name (e.g., a specific marketing email), next to Filters, click Add. Click the first dropdown menu and select Subject. Click the second dropdown menu and select contains or starts with. Click the third dropdown menu and enter the activity details. For example, marketing and sales email open activities will have a subject starting with the word Opened, and submissions of a form named Contact us will have the subject Submitted: Contact us. To run the report, click Run Report. To save the report, click Save.